Something a little different…. 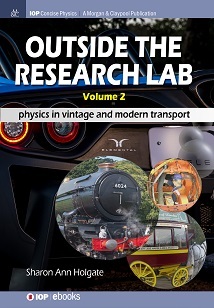 No.6024 features in a recently published and very readable physics textbook written for university students and those with a more general interest in science and technology, “Outside the Research Lab Volume 2 – Physics in Vintage and Modern Transport” by Sharon Ann Holgate. The total reworking of No.6024’s electrical systems during the current overhaul is covered in some detail in chapter two of this interesting and informative book. The locomotive even features on the cover! Other railway related topics covered in the book are the electrical systems on A1 No.60163 Tornado, class 08 and 09 diesel shunting locomotives and the Milwaukee Road streamlined Cedar Rapids Skytop parlour lounge observation car in the USA. The official webpage for this book can be found by clicking here. A short video on the book can be viewed here.